Dr. Ian K. Smith's Get Ready to Shred is the key to jumpstarting significant and permanent weight loss. If you've asked yourself: how to lose that last twenty pounds? How to push through that frustrating plateau? What to do when nothing else is working? Then, you need to know about SHRED - Dr. Ian K Smith's revolutionary diet. 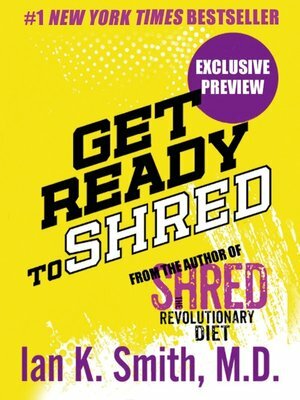 And Get Ready to Shred is your chance to try out the first 2 weeks (recipes, excercises, tips & tricks & more) of the diet. With the SHRED diet (available in full in SHRED - coming from Dr. Ian K. Smith & St. Martin's Press in December 2013), Smith, author of The Fat Smash Diet, has created a program that uses all he knows about strategic dieting in one plan—like putting all the best players on the field at once to create a can't lose combination. SHRED combines a low GI diet, meal spacing, and meal replacements. Those who follow SHRED will be eating often (every three and a half hours! )—four meals or meal replacements (soups, smoothies, shakes) and 3 snacks a day. SHRED also introduces Dr. Ian's concept of "Diet Confusion". Diet Confusion, like muscle confusion, tricks the body and revs up its performance. In the same way you need to vary your workout to see results, you'll switch up your food intake to boost your metabolism. No matter how often or how unsuccessfully you've dieted before, SHRED will change your life. So, dip into Get Ready to Shred (or the full diet in SHRED) and get started on the diet has taken the internet by storm - inspiring thousands to join Dr. Ian's Shredder Nation, losing five or more pounds in the first week! Take the first steps to a new way of life!